Jan 10, 2019 - March 10, 2019. Once again, following in the footstep of their mega hit Carmen Jones, the Classic Stage Company is setting the New York Theater World on fire with two of August Strindberg's most riveting plays, the sexually charged "Mies Julie," adapted from the play "Miss Julie" by Yael Farber, and Conor McPherson's searing adaption of Strindberg's highly autobiographical "The Dance of Death," not coincidentally a precursor to Edward Albee's "Whose Afraid of Virginia Woolf" (1962). It is more than likely, as others have speculated that "Long Day's Journey Into Night" (written in 1941-42, the play opened on Broadway in 1956) was also influenced by Strindberg's "The Dance of Death." 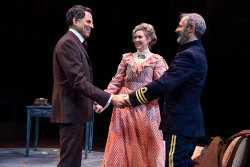 Both plays are in repertory through March 10, 2019. A polymath at heart, there was little that Sweden born August Strindberg (1849-1912), a writer of over sixty plays, thirty works of fiction, autobiography, history, poetry, and cultural analysis, didn't explore, examine, fully embrace, or abruptly turn his back on when it no longer suited him. And this included women's rights, atheism, sinology, painting, and the ideas of Charles Darwin, Emanuel Swedenborg, Jean-Jacques Rousseau, and Friedrich Nietzsche. Forever restless to say the least, Strindberg fathered five children and had three wives (two of who were actresses, both of who acted in his plays). One is simply amazed, how, among so many twists, turns, and turmoil in his life, that Strindberg was able to create, on such a high level, as much as he did. Add to this, the various crises in his private life resulting from his marriage break-ups, political controversies, a painful trial for blasphemy, occasional hallucinatory bouts, psychological and drug-induced self experimentation, and years of self-exile - much of which worked their way into his plays - and you get a fairly accurate snapshot of his harried life. Obviously, Strindberg, as he wrote to the Danish literary critic Edvard Brandes (1847-1932), was driven to make his mark. He knew what he wanted and where he had to go. "I am a socialist," he said, "a nihilist, a republican, anything that is anti-reactionary!...I want to turn everything upside down to see what lies beneath; I believe we are so webbed, so horribly regimented, that no spring cleaning is possible, everything must be burned, blown to bits, and then we can start afresh." "The Dance of Death" -- Christopher Innvar and Cassie Beck. 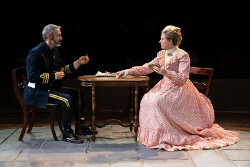 Photo by Joan Marcus. As far as the theater arena which where most of the world knows him best, Strindberg wanted his plays to attain what he called "greater Naturalism." He disliked the expository character backgrounds that characterized the work of Henrik Ibsen and rejected the convention of a dramatic "slice of life" because he felt that the resulting plays were mundane and uninteresting. Strindberg felt that true naturalism was a psychological "battle of the brains:" two people who hate each other in the immediate moment and strive to drive the other to doom is the type of mental hostility that Strindberg stove to describe. He intended his plays to be impartial and objective, citing a desire to make literature akin to a science. And a verbally-sparring warring couple, akin to Albee's razor-tongued George and Martha, is what we get in Strindberg's "The Dance of Death." While the mechanics of this story itself is rather simple on the outside, it is the simmering, boiling, and frequently exploding insides of all three characters, as their life-long pains, fears, and regrets, come to the fro, slap us in our face. Placing all of the action in one sparsely furnished room (formerly a military prison), on an isolated island off the coast of Sweden, with the audience seated on all four sides of the stage, guarantees that not a word or action floats off into space. Yes, Strindberg sets his table like a painting, with every character, location, past and approaching event, playing its part, following its destiny. It is the constantly wavering combustible behaviors of each character, will he, will she, or will they, much like watching a tennis match, that keep our eyes and ears glued to the stage. Here we get a cantankerous Edgar (Richard Topol) and Alice (Cassie Beck), formerly an actress before they married, at home alone stewing in their own juice. Their cook has just quit after Alice insulted her, their children are being schooled on the mainland, and none of the soldiers stationed on the island like Edgar who is seen as an imperious order-giving, self-righteous martinet. In short, all they have is each other. That they are approaching their Silver anniversary only serves to raise the play's combative temperature a couple of notches. Entering into this toxic fray, after an absence of some fifteen years is Alice's cousin Kurt (Christopher Innvar). Once Alice's lover and now divorced, Kurt, who introduced the couple twenty-five years earlier, has just been assigned to set up quarantine facility on the island. Regretting that she gave up her acting career – though watching her one would never guess that she was ever an actress – Alice tells Kurt that her marriage to Edgar is "our long miserable mistake" and that they are "bound by some evil force." As to be expected the actions of all three characters are torn asunder. Soon we are sensing, after seeing a few of Edgar's attacks and a fainting spell, that death might be stalking the ever cantankerous Captain. Even more shocking, as well as totally unexpected, is a newly awakened Kurt lustily telling Alice, as they wrestle passionately while Edgar is elsewhere, "I want to bite your throat and rip out all of your blood like a wolf." And blood he does draw. As the play ends, just as we saw in the play's opening, Edgar and Alice, all played out for this day, sit down for another game of cards, a not too subtle hint that all that has just occurred between lights up and lights down, will continue, like many a marriage, till death do them part. A big surprise, and a welcome one for me, as I love her so, was CSC's Artistic Director John Doyle's selection of Tony winning actress Victoria Clark, (Light in the Piazza) and a director of mostly musicals to helm this production. However, Clark's matter of fact approach to "The Dance of Death" appeared to lessen the play's highs and lows, thus turning the play, as enjoyable as it was to watch, into an everyday affair, rather than a profoundly moving experience that it could have been.